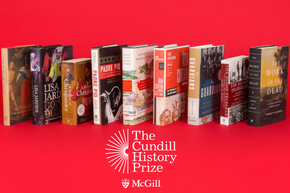 Celebrating its 11th year, the Cundill History Prize announced a record number of submissions for 2018, with more than 400 titles accepted, up 25 percent from last year. Administered by the Faculty of Arts, the US$75,000 prize will be awarded by a distinguished jury of world-leading historians. Five jurors were recently named to judge the impressive list of titles, which includes authors from richly diverse backgrounds tackling subjects as varied as religion and war, feminism and natural disasters, global finance and music.